Préservation of architectural forms with the goal of a efficiency energy and a high environmental materials and local. The project is currently in the planning process. The design of the project by the project management team will be held in spring 2014. Work will start in spring 2015. Performance tests will take place at 3 years after completion. The objective of energy performence is the thermal regulation of the existing + 30% of improvement. Mixed mode heating with wood boiler with other energy supplement to clarify, solar hot, mecanical ventilation double flow, low consumption lighting, presence detection. There is no need for thermal summertime confort considering the geographical location (1500m altitude). Acoustic comfort is achieved trough the realisation of efficient double glazing. The roof insulation and walls will be performing in acoustic et thermal level. The use of wood will be advised, and ecological insulation materials. The proximity of production of these materials wil be a factor of choice (local resource). 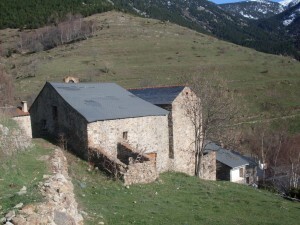 The use of slate for roofing will be favored, and the stone for the parties directly involved in the church. The barn is located in a avalanche zone. The consolidation of the walls and roof will be necessary. Structurals constraints may impact materials could be used.